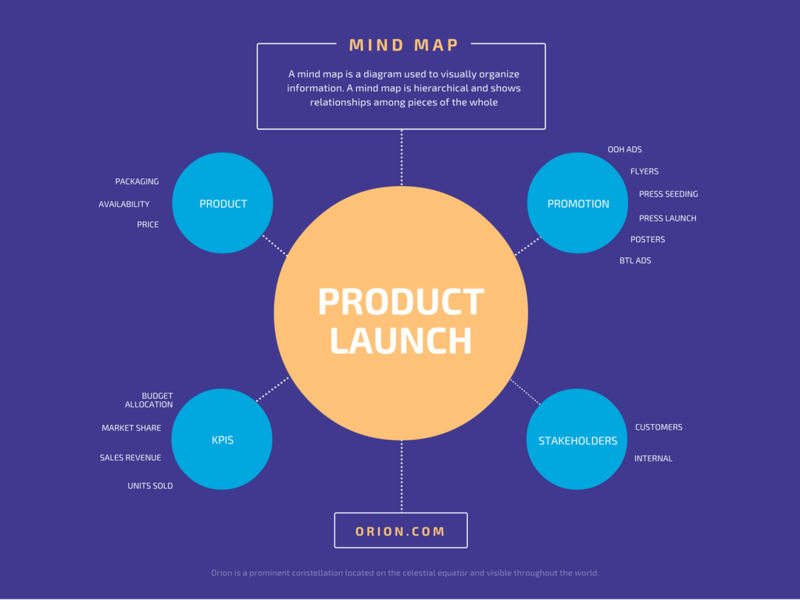 Organize your thoughts and present your big idea with a beautifully crafted Mind Map from Canva. Ever feel like you have too many thoughts floating around in your head? Then, mapping them out could be just what you need to brainstorm, take notes or work through complex problems. This exercise helps bring your ideas to life by creating a visual map of your thoughts so you can remember better, identify correlations, and see the big picture. With Canva’s free online Mind Map maker, you can easily create a beautiful Mind Map design. Our team of amazing designers have created professional templates that you can quickly edit and customize. Just choose the perfect template for you, edit its elements, and start mapping your way to your next AHA! moment. Create a new Canva account to get started with your own Mind Map design. Choose a template and click on the text and images to start customizing your map. Mind Maps can leap from topic to topic so keep your thoughts organized by color coding your design. Change a branch or text box color according to the topic they’re assigned to so you can easily find and connect interrelated ideas. Use Canva’s color palette tool to choose any color in the spectrum or type in a specific hex code. Brainstorm with your team anywhere in the world by getting your team’s input on your Mind Map design. It’s as easy as sharing a link to an editable version of your design. Now your team can access your Mind Map and add their own edits, thoughts and ideas any time and from any desktop, laptop, iPhone, iPad or Android device. When you’re all done you can simply download your design as a JPEG, PNG or PDF file, share it on your social media, or email it directly to someone.